Keep it Sweet! Fun, Over-the-Top Pieces for Playrooms and Nurseries! Candy. It’s a theme that seems to be universal and forever current. From the ubiquitous candy bar at parties, to the popularity of trendy sweet shops like Dylan’s Candy Bar and IT’SUGAR, candy’s moment is here! It’s no wonder candy and sweets have trickled their sticky selves into interior design. It’s a new year, and there’s no time like the present to start things off sweetly with some candy-inspired furniture! Check out this awesome ice cream sandwich! It looks so cool, literally! Great for a playroom! These button candies were always my favorite at the penny candy store—how about bringing some of this graphic, candy-coated fun into your interior decor? Custom sizes and options available! This candy table can be filled with anything you’d like! Pictured below are all gumballs, however pieces like this make it super easy to customize a big statement! How about filling it with sand and shells for a seaside feel? Or you could fill it with small toy cars, or you could even fill it with glitter! Valentine’s Day is just around the corner, and what better way is there to bring love into your life than with this foam-filled Hug Me ottoman? Available in any color or saying you’d want, it would add a nice color pop to a space, as well as a cheeky sense of humor. For more sweet looks, check out the whole candy-inspired furniture collection by Jellio. They can make your sweetest dreams come true with ready-made or totally customizable treats for your home! Shop Gilt’s “Dream Nursery” Sale Today! 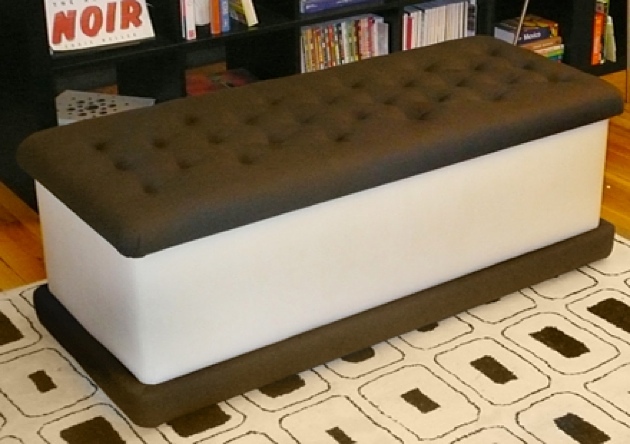 Love the hug me ottoman!! Perfect for the nursery I’m creating. . .which has to be shared with a 9 year old! I think she’d love something like this!